Maintaining good relationships with happy loyal customers costs a lot less than acquiring new customers; and the former boosts your bottom line further by bringing you more customers, when they tell others how excellent you are. Therefore, the first step to maximizing returns on brand management dollars is to identify your most profitable customers. At Nexus Link, we help you segment your current customers using our Brand Affection – Brand Allegiance analytical framework. Brand Affection: captures the attitudinal component of the relationship between your customers and your brand. It comprises both affective (emotional) facets as well as cognitive (rational) facets of evaluation. Emotionally, customers may evaluate your brand based on whether or how much they identify with your brand personality, brand values etc. They may also assess your brand based on rational considerations such as perceived value-for-money, compatibility with their core needs etc. A customer who ranks high in brand affection likes the brand very much and evaluates the brand very positively. Brand Allegiance: refers to your customers’ intention to stay with your brand disregarding competing offers. The distinction between brand allegiance and brand loyalty as used in the framework must be highlighted – the former refers specifically to the intention of commitment. Whether loyalty (the behavior of commitment) results from allegiance depends on a host of circumstantial factors that are outside the customers’ sphere of direct control. A customer who ranks high in brand allegiance has strong intentions to stay with the brand. Partners: These customers are the holy grail of any branding effort. Not only do they hold the brand in very high regard (high brand affection); they also intend to stay with the brand despite competing offers (high brand allegiance). Partners are also the ones who will help you propagate your brand via word-of-mouth recommendations. Players: Players are also customers who like your brand very much (high brand affection), for now. What distinguishes them from your Partners is their non-committal attitude (low brand allegiance). These customers are open to offers from competing brands – and as and when the balance tilts in the other direction, the Players will be ready to make the switch. 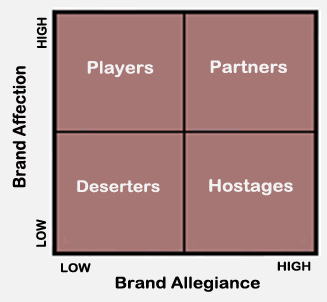 Hostages: These customers are committed to their relationship with your brand (high brand allegiance) – perhaps grudgingly so, because they do not hold very positive attitudes towards your brand (low brand affection). There can be various reasons for their commitment nevertheless – the lack of a better alternative, high switching costs and contractual commitment are common factors that hold these customers ‘hostage’ to your brand. Deserters: With a lack of highly positive attitudes towards your brand (low brand affection) and no expressed intentions to stay (low brand allegiance), these customers may well be prepared to take flight at the next available opportunity. Having identified the above customer segments, an appropriate set of strategies should then be devised to prune the portfolio into ideal proportions or to maximize the returns on brand management investments. At Nexus Link, we do not believe in a standard solution. It is our conviction that the optimal strategy-mix is necessarily one that is tailored for a perfect fit with the client’s needs. We will engage in extensive consultation with our clients to account for such factors as the current customer-mix, the current brand management returns as well as industry idiosyncrasies, in formulating the optimal solution.